Please hover over the image to see more image about purchasing the products. When I first knew I was going to be a mother, one of the many things I dreamed about were sink baths in a kitchen full of morning light. Now that dream has become a reality, and it's sweeter than I even imagined. I love the sunshine creeping in as little toes pop through sudsy water, giggles float around like escaped bubbles, and the smell of a fresh babe fills the room. It's motherhood moments like these that I'll hold onto forever and tuck away to reminisce on once my babies are too big to fit in the sink. Until then, I'll be bathing my little loves under the kitchen window in the sink. And I'll be choosing the new and improved, inside and out, JOHNSON'S® for gentle use on my babes' tender skin. JOHNSON'S® COTTONTOUCH™ Newborn Baby Wash & Shampoo is fast-absorbing, leaving no unwanted residue behind to help babies' skin less slippery. And you mamas know how slippery a wet baby can be! 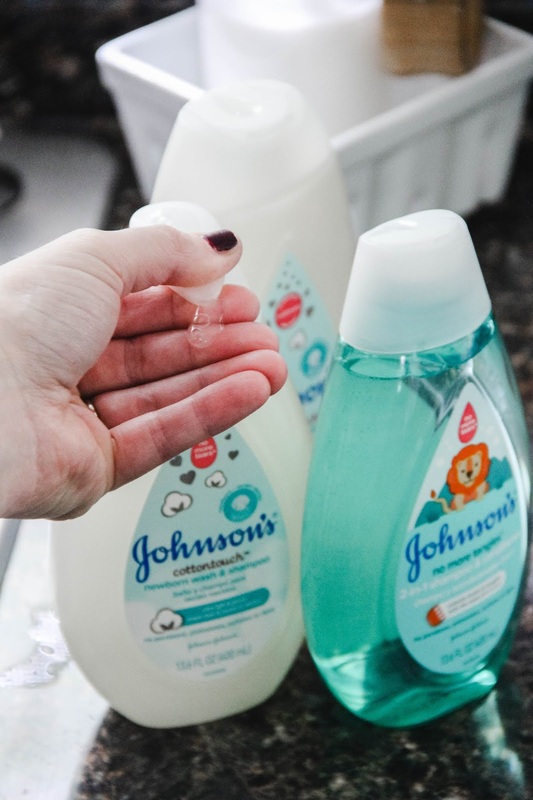 I am pairing the wash and shampoo with JOHNSON'S® COTTONTOUCH™ Newborn Baby Face and Body Lotion. The lotion was specifically designed for newborn's delicate skin, and the real cotton enables an ultra-light touch to encourage more touch and interaction with baby. 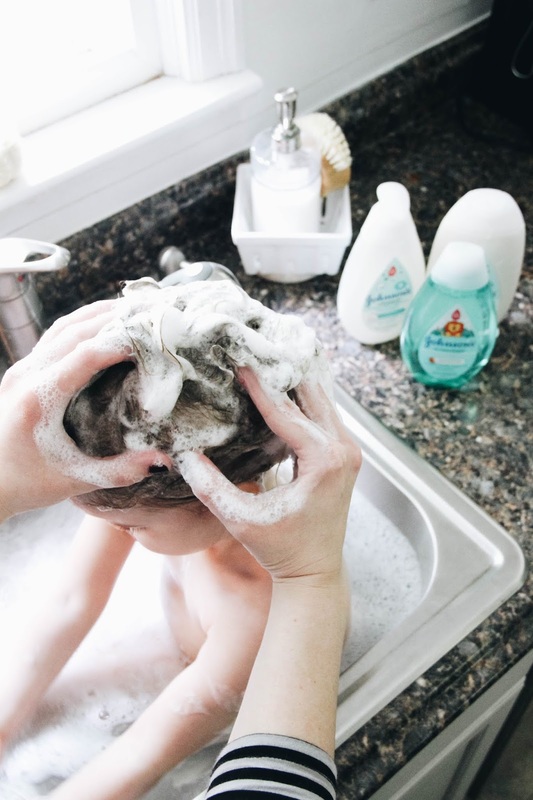 The 2-step wash and lotion routine is proven to build a stronger connection between you and baby. We love the duo of wash + lotion so much that we use it on our newborn and our toddler. We have also been loving the new redesigned bottles. The enhanced functionality of adding the pump to the top of the bottles to help a mama out when she has full hands makes bath time so much smoother. So not only is it simpler to use for mama, but it's also simpler, gentler products that 9 out of 10 parents would recommend. We love that JOHNSON'S® is 100% gentle, and free of parabens, and phthalates. So how do we make these sink baths so memorable? And how can you? We make sure to have special bath time toys. The favorites are beach toys (ie: a bucket, shovel, sand molds) and bath paint. After the washing is done, we set aside play time in the water. Let music play in the background. It's usually oldies in our house. Get creative with the washing and shampooing. For instance, when we're rinsing her hair out, we always pretend she's at the salon. Or while she's getting cleaned, we find the tickle spots to give a little extra scrub for those sweet little giggles. Play along with them. Let their little imaginations run wild and join in. We grabbed our bath time routine essentials at CVS for exceptional savings. Buy 1, Get 1 50% on JOHNSON'S® Baby. And spend $30, Get $10 ExtraBucks. CVS was a great one-stop-shop for us to grab all of our favorite JOHNSON'S® bath time products easily and affordably! Our CVS is centrally located making it so simple for use to swing by while we're out and get anything on our 'pick-up list.' We love having it as an option for getting the essentials. 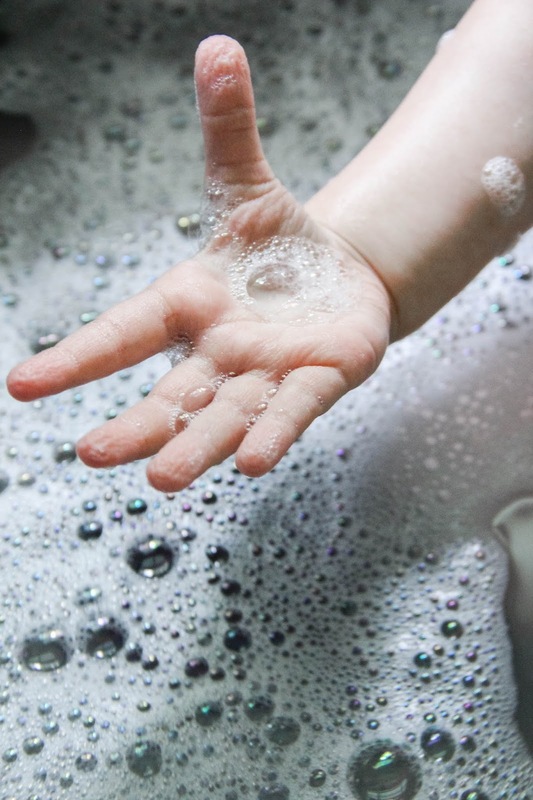 There's nothing like creating memories while having fun, and I hope my girls will fondly remember their sink baths long after they stop taking them.